Boy oh Boy have I been busy working on something new and exciting for you! You see, for the past few weeks I’ve been thinking and thinking about how to place more giveaways up on the blog without seeming like I’m buying your love. I love books. This has been well established. Heck we even bought my comfy chair based on the sole purpose that I needed a place for me to read. So it should come as no surprise to y’all that every now and then I need to clean up the books that I have scattered throughout my house, car, and most importantly my bookcase. And this time, rather than just pass these books along to the nearest library, I thought I would share two of the very talented authors with YOU! 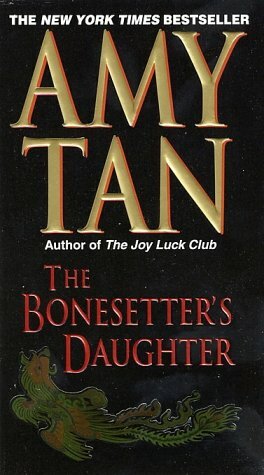 First up you have Amy Tan. Amy Tan is an author who primarily explores mother-daughter relationships and has even had a book turned into a major motion picture, you might recognize the title called The Joy Luck Club. Today I have another one of her titles up for grab’s entitled The Bonesetters’s Daughter. Leave a comment letting me know which book you want. Tweet the following “@MrsOurMA is hosting a giveaway at http://wp.me/pU1Hp-hB be sure to check it out and enter!” and leave me a comment letting me know you’ve done so. That’s all it takes….and that is three chances to win. The giveaway will run from now until noon EST on Thanksgiving Day (this Thursday). The winners will be announced later that day after random.org helps me figure out who they are. Books will be shipped out to the winners Monday next week. Good luck everyone! Fridays are great aren’t they? I mean you can say hello to the weekend (unless you are Alex who is sticking his tongue out at us all as he always works Saturday), you can paint your nails, you can watch a movie and stay up past your bed time. And maybe just maybe you can order pizza for dinner. That was always my favorite part about Friday. Too bad I’m over pizza now. Still you know what Friday’s do to my brain? They drizzle it down from the high processes of complicated thought and reflection to a puddle of left-over ice cream. Delicious but useless. So today I’m opening up the blog to YOU! Post a question in the comments section and Monday I’ll post my replies. Any question at all. I’m pretty much an open book here. You can also post questions on Our Marriage Adventure’s Facebook page or tweet me. If you want to know what size boots Alex wears, I’ll tell y’all after I sneak a peek since even I don’t know that for sure. If you want to know how I like my coffee, I’ll tell y’all. If you want to know what my favorite thing about this weekend was I’ll tell y’all. You get it yet? Anything you want to know, I’ll tell y’all! Now then, for a preview of up-coming attractions, on Saturday I’m emptying out my book-case. I’m taking photos, and I’m giving those books away. Be sure to check back on Saturday for the contest info, books I’ve decided I know longer need and to enter into the contest! Tuesday I am going to share all about our latest adventure which is taking place this weekend. Where we go back to the place of banjos and family and have the first thanksgiving meal of the year. With more to come. I hope y’all like turkey!